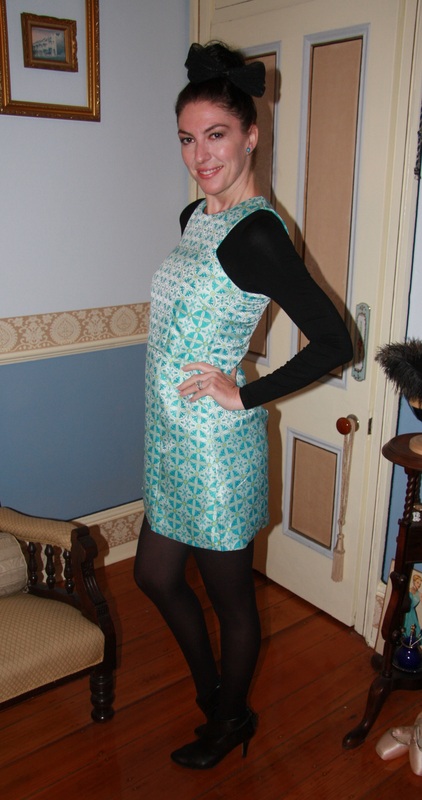 Outfit: Mod 1960s style A-line mini dress in turquoise and silver geometric print featuring notched front hem, worn with black long sleeve top underneath. Shoes: Black leather ankle bootees with tassel. Hair: Worn in a ballerina bun with a large black bow clip. Accessories: Black opaque tights, gold bracelet with turquoise panels, vintage turquoise stud earrings.